The center airbag sensor assembly communication circuit consists of the occupant classification ECU and center airbag sensor assembly. 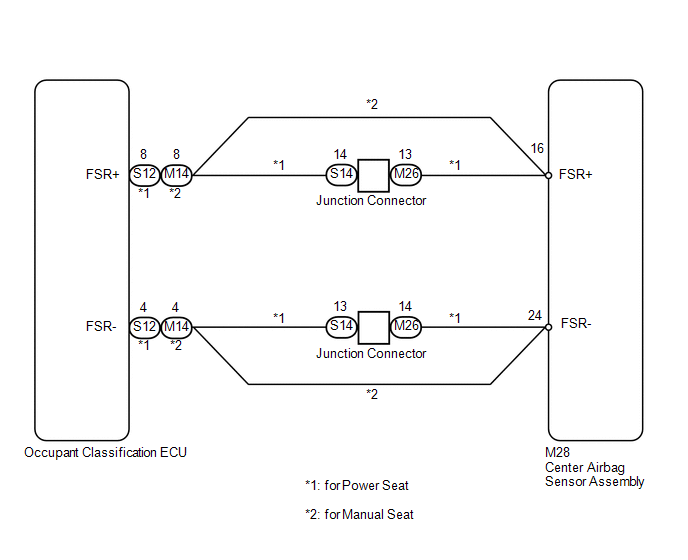 DTC B1790 is recorded when a malfunction is detected in the center airbag sensor assembly communication circuit. The occupant classification ECU receives a line short circuit signal, an open circuit signal, a short circuit to ground signal or a short circuit to B+ signal in the center airbag sensor assembly communication circuit. If troubleshooting (wire harness inspection) is difficult to perform, remove the front passenger seat installation bolts to see the under surface of seat cushion. In the above case, hold the seat so that it does not fall down. Holding the seat for a long period of time may cause a problem, such as seat rail deformation. Hold the seat only as necessary. Check that the connectors are properly connected to the center airbag sensor assembly and occupant classification ECU. Also check that the connectors that link the front seat wire RH and No. 2 floor wire are properly connected. Disconnect the connectors from the center airbag sensor assembly and occupant classification ECU. Also disconnect the connectors that link the front seat wire RH and No. 2 floor wire. 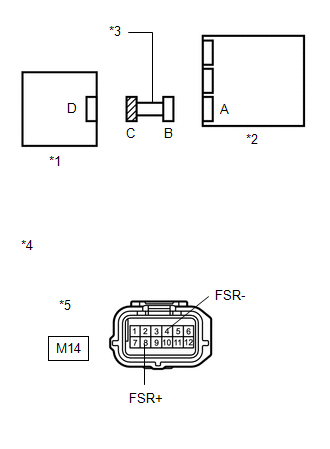 (a) Disconnect the connector from the center airbag sensor assembly and occupant classification ECU. 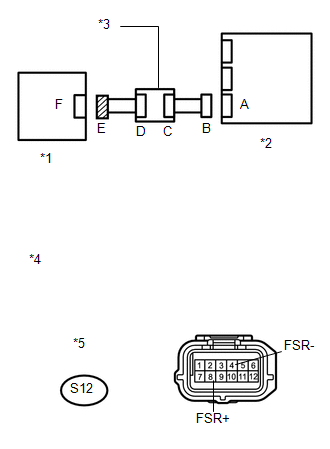 (c) Using SST, connect terminals 16 (FSR+) and 24 (FSR-) of connector B. (a) Connect the connectors to the occupant classification ECU and center airbag sensor assembly. 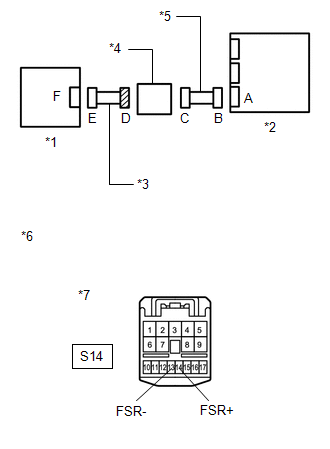 (e) Clear the DTCs stored in the occupant classification ECU (See page ). (f) Clear the DTCs stored in the center airbag sensor assembly (See page ). (h) Turn the ignition switch to ON. (i) Using the Techstream, check the DTCs of the occupant classification ECU (See page ). DTC B1790 is not output. Codes other than DTC B1790 may be output at this time, but they are not related to this check. 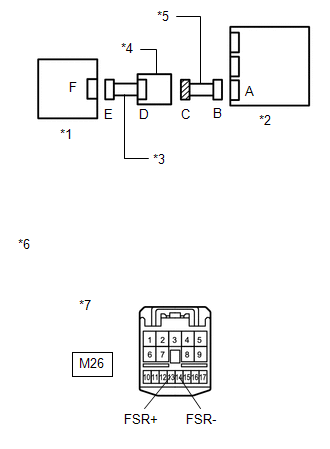 (f) Using the Techstream, check the DTCs of the occupant classification ECU (See page ). (a) Connect the connectors that link the front seat wire RH and No. 2 floor wire. Do not forcibly insert SST wire into the terminals of the connector when connecting.